Those who prefer their didacticism a little more diffuse should investigate Code Unknown (2000), which Criterion is releasing on DVD and Blu-ray this week. This isn’t necessarily Haneke’s best film (though it’s certainly in the running), but it’s definitely his least hectoring and (befitting its title) his most mysterious. Indeed, it takes a long time just to determine what Code Unknown is about, as its multiple narratives appear largely unrelated. Characters from one story occasionally encounter those from another, but not in the usual way that suggests everything is connected—it seems more like a means of imposing some small degree of structure on what’s basically a series of non-comedic blackout sketches organized around a common theme. Eventually, it becomes clear that Haneke is interrogating the idea of intervention, as it plays out between lovers, between strangers, and between nations. That may sound tediously academic, but Haneke’s skill at orchestrating almost unbearably visceral confrontations makes it anything but. The film’s remarkable seven-minute opening shot sets the tone and introduces several of the key players. As a woman (Juliette Binoche) and teenager (Alexandre Hamidi) walk down the street in Paris, the kid thoughtlessly tosses some trash into the lap of a Romanian beggar (Luminita Gheorghiu, who’d make a splash a few years later in The Death Of Mr. Lazarescu), then gets accosted by an angry witness (Ona Lu Yenke), eventually leading to a full-blown scuffle that’s ended with a sharp cut to black in mid-lunge. Haneke employs these abrupt terminations (a device that’s more commonplace now, but was unusual 15 years ago) throughout as he follows these people along parallel narratives. Binoche’s character turns out to be an actress shooting a film in which she’s terrorized by a madman; in real life, she’s troubled by what sounds like possible child abuse in an adjacent apartment. Her photographer boyfriend (Thierry Neuvic), lately returned from documenting atrocities in Kosovo, constructs a camera that can surreptitiously take pictures of fellow passengers on the subway, stealing unmediated moments of their lives. And the opening scuffle (precipitated by the photographer’s little brother) leads to both the arrest of the angry witness, who’s West African, and the deportation of the Romanian beggar, with upsetting repercussions for both. None of these mini-stories resolves in any traditional dramaturgical sense. Instead, Haneke uses them as a means of exploring all of the ways in which incomprehension and uncertainty can impede meaningful interaction, even when people have the best possible intentions. Some scenes, like one in which Binoche’s actress gets harassed on the subway by a gang of toughs—she moves from seat to seat as they taunt her, surrounded by studied indifference from fellow passengers, until a meek-looking fellow finally stands up in her defense—function as masterful short films that barely require any context. Others bounce off of each other in thought-provoking ways, or challenge you to figure out how they fit the pattern. 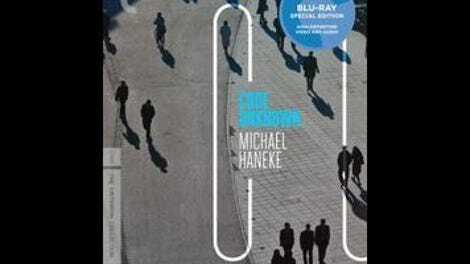 The Criterion release features two separate interviews with Haneke in which he discusses his intentions, but watching them right off the bat would be counterproductive. Code Unknown makes every viewer a cryptographer, attempting to unlock the complexities of human nature and societal discourse. For all its superb menace and tension, it’s as close to pure compassion, devoid of moral lecturing, as Haneke has ever come.